The severe winter weather continues and is making observations difficult. 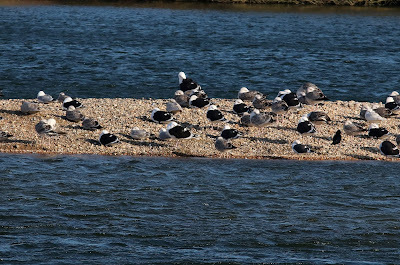 A party of seven Pintails flew east and the regular Glaucous Gull and at least four Mediterranean Gulls were among the huge numbers of gulls at the Patch. Strong winds, very cold and with some snow overnight and during the day. The numbers of gulls increased at the Patch but with only the regular Glaucous Gull and six Mediterranean Gulls of note. A Fieldfare was the only sign of any cold weather movement on the land. 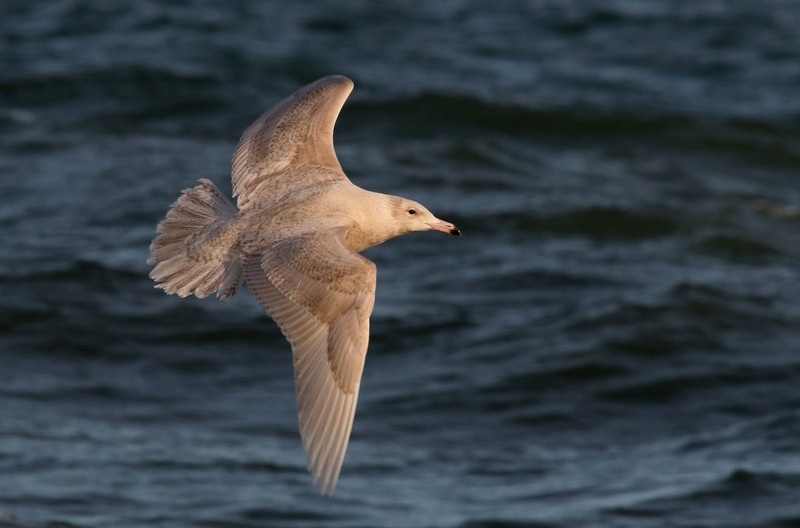 More wind and getting colder and not much to be seen except for the regular Glaucous Gull at the Patch and an adult Yellow-legged Gull at the fishing boats. The wind and cold continues and very little to be seen other than the regular Glaucous Gull at the Patch. 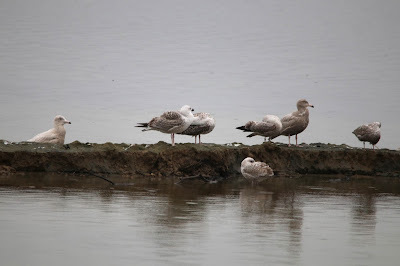 The gulls provided a decent bit of interest on the RSPB Reserve where a second-winter Iceland Gull and a new juvenile Glaucous Gull joined the regular bird. If you look carefully you can see an Iceland Gull and both Glaucous Gulls in this image. 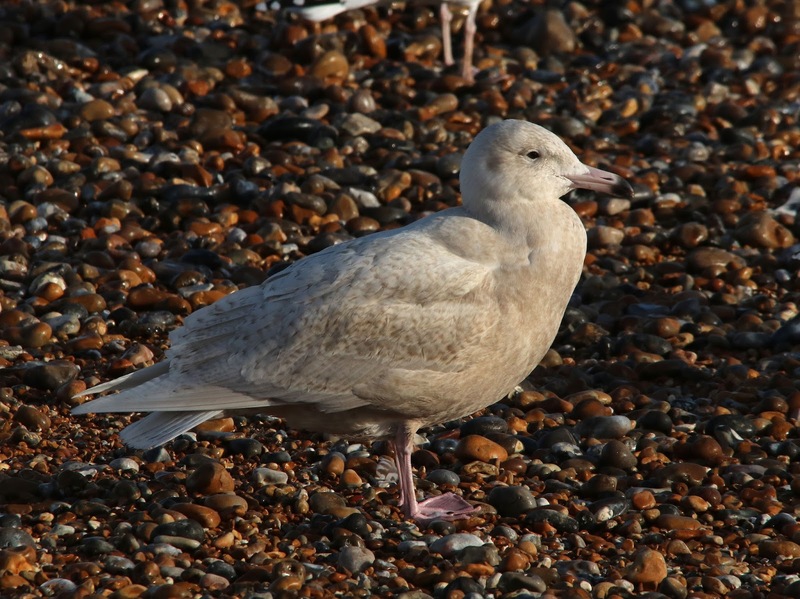 A bitterly cold and windy day and not much to report other than the regular Glaucous Gull at the Patch/Power Station along with an adult Mediterranean Gull. A cold and breezy day and limited coverage. The Glaucous Gull was at the Patch again but very little else was seen. The regular juvenile Glaucous Gull was feeding around the Portakabins in the power station again. Three Snipe, a Song Thrush and a Rock Pipit were of interest on the land. Another miserable morning of rain and very poor visibility. 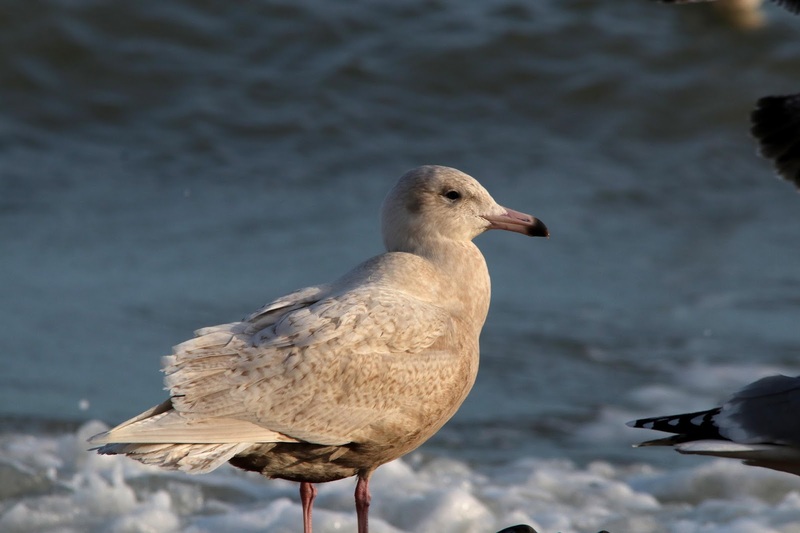 The two Glaucous Gulls were seen at various times during the day and an adult Mediterranean Gull was also seen off the the fishing boats. The best of the birds on the land were a Mistle Thrush, five Song Thrushes and two Bullfinches. A Porpoise was feeding with the Cormorants offshore. A miserable day of almost constant rain. Coverage was limited but at least 80 Red-throated Divers flew west and the regular juvenile/first-winter Glaucous Gull was seen at the Patch. 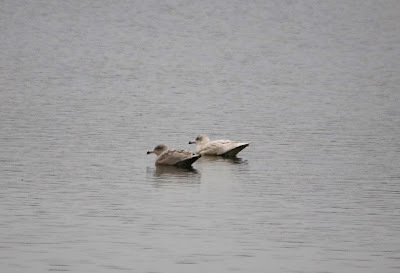 Late in the day, both of the Glaucous Gulls were found on the RSPB Reserve. 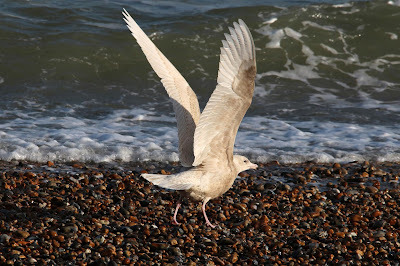 A rare opportunity to get two Glaucous Gulls in one photograph although the light was very poor. 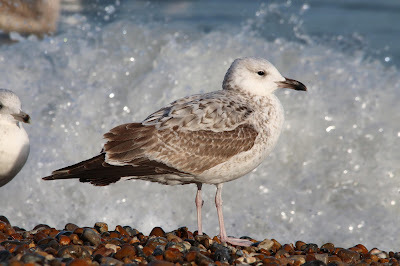 Most of the days interest was on the beach where two juv/first-winter Glaucous Gulls and a new first-winter Caspian Gull joined the throng at the fishing boats and three Velvet Scoters and an adult Mediterranean Gull passed through. 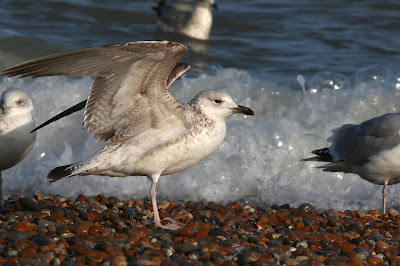 The juvenile Glaucous Gull and an adult Mediterranean Gull were among the gulls feeding at the Patch but there was very little movement offshore in the calm and sunny conditions. A Merlin and a Mistle Thrush were of interest on the land. 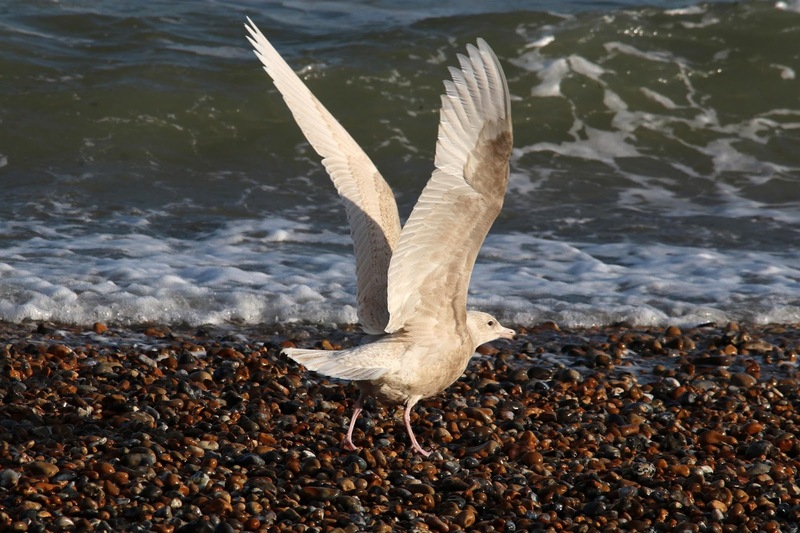 The juvenile Glaucous Gull was feeding inside the power station behind the Patch Hide again. 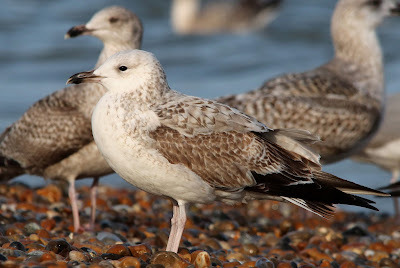 A third-winter Caspian Gull, an adult Yellow-legged Gull and the juvenile Glaucous Gull were all seen at the Patch. A miserable day of very strong winds and heavy rain produced a decent movement of birds offshore with 1.5hr watch producing eight Fulmars, 576 Gannets, 1341 Kittiwakes, 2500 Black-headed Gulls, a Mediterranean Gull, 580 Guillemots, 305 Razorbills and 500 auks. 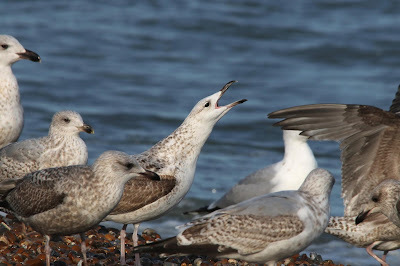 At least one Dartford Warbler was seen this morning and the juvenile Glaucous Gull was still on the beach. A 1.75hr seawatch this morning produced 52 Fulmars, 75 Kittiwakes and an adult Caspian Gull passing west and a Great Skua moving up-channel. 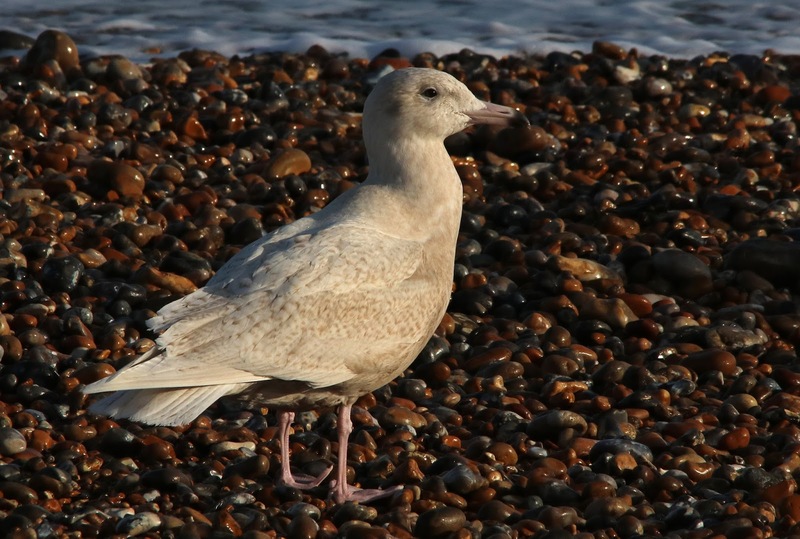 The juvenile Glaucous Gull was feeding around the Patch again. 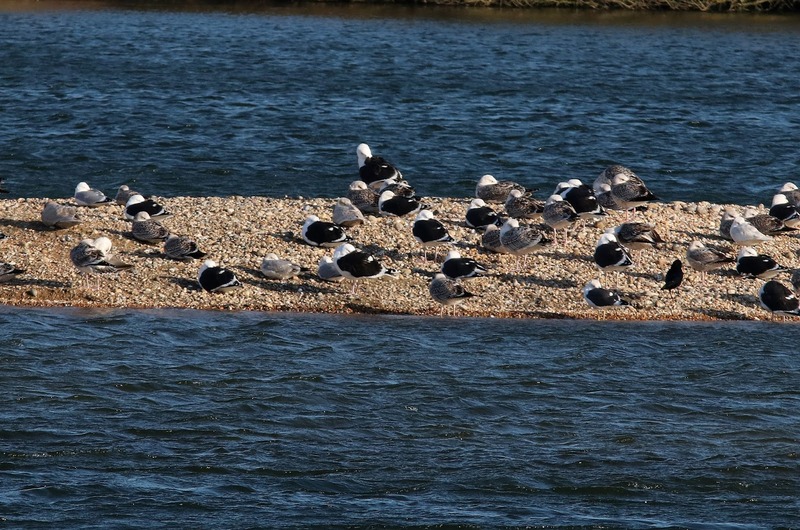 Despite there been plenty of birds at the Patch this morning there was nothing of any note to be seen. 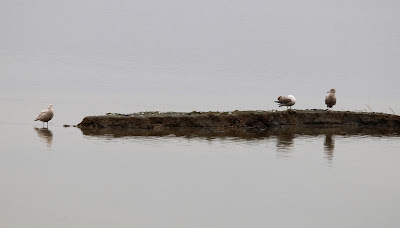 A Snipe and two Bullfinches were the only notable birds to be seen on the land. 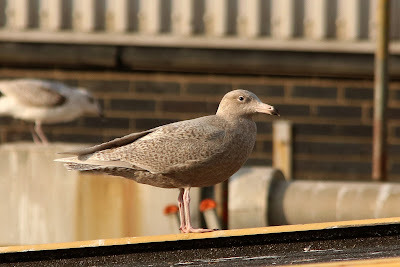 The Glaucous Gull was feeding inside the power station complex behind the Patch hide this morning but there was little else to be seen. The juvenile Glaucous Gull was feeding at the Patch again. 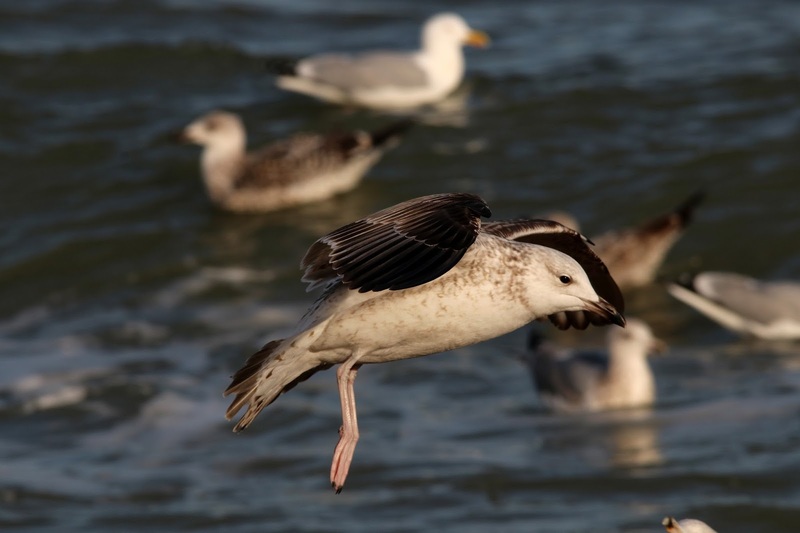 Seawatching during the morning produced 98 Brent Geese, 40 Fulmars, 1000 Cormorants, 185 Kittiwakes, 932 Guillemots and 682 Razorbills and the regular first-winter Caspian Gull. 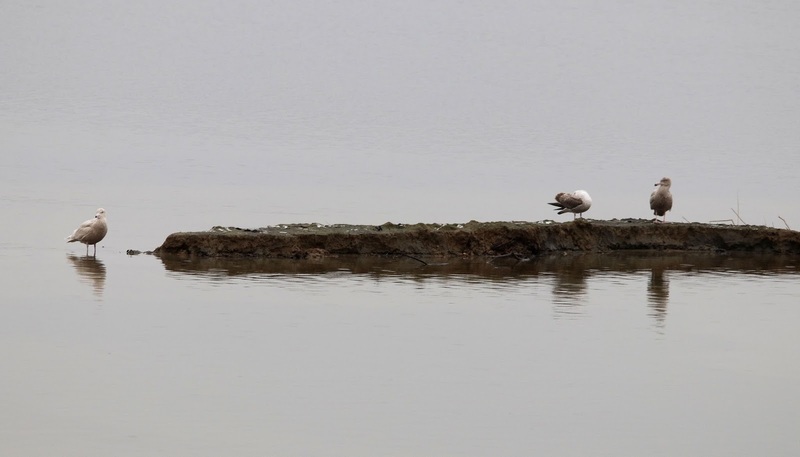 Two Marsh Harriers were seen over the trapping area. The first-winter Caspian Gull was seen at the fishing boats, a Dartford Warbler was feeding among the gorse and broom at the Point and two Bullfinches were seen in the trapping area. Three hours of seawatching during the day produced 1000 Cormorants, two Great Skuas, 221 Kittiwakes, 1520 Guillemots, 880 Razorbills and 430 auk species and the the regular Caspian Gull feeding at the fishing boats.